As already reported, KAT-TUN member Taguchi Junnoske announced that he is leaving KAT-TUN and Johnny & Associates next spring, a surprising announcement that made it to the top of worldwide trending topics and gave NTV’s Best Artist its peak rating of 19.6%. Moments after Junnos’ annoucement, statements from J&A and the members were posted on Johnnys Web. An official English version was recently updated, as can be seen below. Thank you very much for your patronage and support. We apologize for the sudden announcement. Johnny & Associates and KAT-TUN member Junnosuke Taguchi have come to an agreement not to proceed with a contract renewal. We hereby announce that Junnosuke Taguchi will be leaving KAT-TUN and Johnny & Associates next spring. We also sincerely apologize to all of the fans, who have been supportive of the group, for having to make this announcement as KAT-TUN’s 10th anniversary next year is approaching. Johnny & Associates also offers an apology for the troubles caused to all interested parties who have supported Junnosuke Taguchi and KAT-TUN. We will be discussing the time of withdrawal with producers so as to minimize the impact on the programs that Junnosuke Taguchi is currently appearing as a regular member. Johnny & Associates is not planning on the dissolution of KAT-TUN at this time. However, we will be discussing future plans for the group that will bring the best results for the remaining members, and will bring you updates at a later time. Thank you very much again for your continued support. Thank you for continuously supporting KAT-TUN. I apologize for the sudden announcement. I, Junnosuke Taguchi, will be terminating my contract with Johnny & Associates for personal reasons. I am grateful to all of you for having been supportive at all times up until now. I have enjoyed the privilege of giving concerts and taking part in TV programs, among many other experiences as a member of KAT-TUN. I was able to reach out to everyone through such activities, and I will never forget those memories. 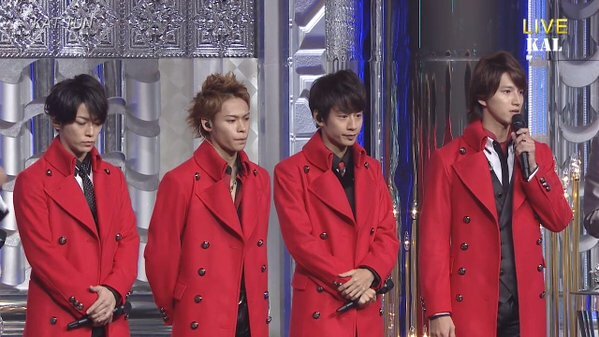 KAT-TUN will be celebrating its 10th anniversary in 2016, and I will also be turning 30 very soon. I felt this was an important time in my life to consider where I will be going from here on. My conclusion has resulted in parting ways with KAT-TUN, but until the last day of my activities as a member of KAT-TUN, I intend to give my very best. We are very sorry for this sudden announcement. During the ten-odd years that we spent as KAT-TUN, we have saddened our fans so many times. I am so sorry and full of regret. It has been 2 years since Tanaka left. While receiving support from our fans and staff, we have come this far with a feeling of needing to deepen our bond and to stay together. Next year will be our 10th anniversary, and there is a need for us to stay closely united as a group. But in the meantime, different feelings started to develop little by little among the members, and we talked about our inability to share the same feelings in proceeding onward. Personally, I honestly don’t know what to say. I regret that I couldn’t fulfill my responsibilities and the hopes that I had been telling everyone. I kindly ask for your understanding in allowing me to accept his decision as an individual. To be honest, I have mixed feelings about it. But as Kazuya Kamenashi, I would like to spend my time doing my best at what KAT-TUN can do now. I deeply regret that I have to inform you of such circumstances. I am so sorry for betraying the trust of the staff and all of our fans, who have loved and supported the four of us, so many times. When KAT-TUN set out again as a group of four, we promised the fans to stay together as KAT-TUN. As long as our fans support us, I want to stay as KAT-TUN. However, because he is a different individual, it cannot be helped that we do not share the same feelings or opinions, despite being in the same group. I tried to persuade him many, many times, but his mind was set. I am very sorry for not being able to change his mind. I am now full of regret as much as I feel my own inadequacy. We will do our very best, so we ask for your continued support. To all Johnnys web members, I am deeply sorry for having to give you this news today. One of our members Junnosuke Taguchi, will be leaving the group. KAT-TUN has been active as a four-person group for 2 years, establishing itself as a new group, thanks to your support. We considered it best to continue our activities with the current members, and I personally spent a lot of time talking with Taguchi so that we would have no regrets. However, there was a huge gap between how we perceived entertainment business, and despite my efforts, I just could not fill that gap. With the group’s 10th anniversary of debut approaching, we wanted to deliver something positive to the people who have been continuously supporting us. We are truly sorry that a member’s withdrawal has been decided against that hope. I personally feel greatly saddened that a friend, with whom we have shared both happiness and hard work for such a long time, is leaving the group. Since there are people who are going to be affected by this, I cannot agree to his decision. However, I also hope that everyone can warmly watch over Taguchi, who has chosen a different life as an individual person separate from KAT-TUN. We will strive even harder from here on so that KAT-TUN can receive your continued support.